The Metal Detecting Seminars in Cue Have proved Popular. Wheres the Gold Price Going - UP or DOWN? Here is a few comments we have had from our emails..
..... "I just wanted to contact you re the course at Cue to thank you and Sue. The course was professionally run and a joy to participate in. I learnt a lot and feel much more confident detecting. When you next speak to Udo please pass on my appreciation for not only his contribution to the training, but also for the generous use of his lease. " ..... "just wanted to say a big thanks for having me on your Gold Prospecting Course. I thought you guys did a great job in organising the training. The whole course was very well organized and structured. I learnt so much in two days that I am sure it has saved me years of time. I felt well supported by all the staff throughout the course. A big thank you to yourself Bill and to your wife Sue. You both were very helpful to me personally during my training. Being a "new chum" I needed all the help I could get. Also a big thanks to Udo for letting me camp on his block and prospect there. I caught up with Udo at his house the night before I returned to Perth and heard some amazing stories of gold and the old prospectors !!!" ..... "Gday Bill Sue & Udo ,Thanks for a great weekend , the seminar was fantastic I learnt a heap more than I was expecting. the class was really imformative and in the short time in the field Sue & Kirk put me on the right track with mineralised ground noise"
Udo is really worried that we are teaching people too well, they seem to be finding plenty of gold on his Mining Lease after the course see the facebook page Gold Prospecting WA Facebook Page. He estimates that there has been around 4 to 5 ounces of gold found after the courses - and thats the stuff he knows about! Here is a link to a film where some people from the last seminar camped there for a few days and Leon found a nice 23 Grammer (There was also a 66 grammer and a 22 grammer found in an earlier course and plenty of other smaller nuggets). 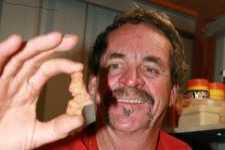 The movie is on the Gold Prospecting WA Facebook pageGold Prospecting WA Facebook Page Video. Sorry folks, still havent worked out a way to give you a direct link to the video yet but if you go to the Facebook page it is the first video, just click the arrow and you will be able to view it. Thank you to all the people who have been completing the forms for the second half of 2012 year training seminar. We are changing our email provider because the current one does not allow us to send out separate email newsletters to just those who are interested in the training dates with news. We are in the process of that change now. When that change has been completed we will contact all those who have put in a training request form with their preferred dates so they get the first dibs on the training. After that we will send out a special newsletter offering any vacancies to those who are interested in the spare positions available. Please subscribe up to the www.gold-prospecting-wa Facebook Page where we put up information regularly on Metal Detecting Seminar Information. 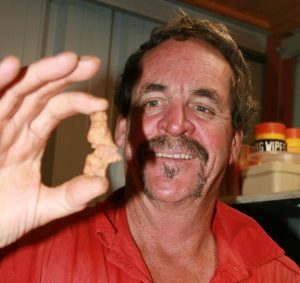 Gold Prospecting WA Facebook Page. There will be a new Minelab metal detector available on 28th May 2012. The CTX 3030. Its a VLF but with a lot of features. This looks like a fantastic machine for the treasure and relic hunters and may even be a good unit on the very quiet goldfields grounds – that is still to be tested… we will buy one and test if for you. ….Why, because if you can use it on the quiet Ground then you can make use of the awesome new discrimination for Ferrous and Conductivity which will enable you to separate close together metal targets and identify them. Features of the new Minelab CTX 3030. Wireless Audio,Use the internal audio supplied or option is waterproof speakers ,or even use your own favourite audio headphones. Ferrous and Conductivity Discrimination Enables you to detect the targets you want and ignore the rest. Target Trace allows you to determine the types of targets where there is two targets close together. GPS Locating inbuilt Where you can find out where you are and it enables functions like geotrials, target waypoint entry, finding waypoints – truly a great step forward in merging technologies! PC Mapping enables you upload your setting, localities, waypoints onto your PC and attach photos and text of your finds – you can view them in Google Maps. Oh Boy, this is one of the greatest failings of modern detectorists in my opinion, they don’t keep enough records of their finds!! New Minelab ctx3030 Metal Detector . Remember, to get access to Granted EXPLORATION (E) Leases all you need do is to get your Section 20a Forms in for Exploration leases well before you want to go prospecting, the last two we have been involved in took a few weeks to be returned by the Department of Mines. SO get your Section 20a applications in early. Section 20a Permit System - Video Guide. We have been testing the Nuggetfinder 8 by 6 inch mono coils on both the Minelab 5000 in Fine Gold and the Minelab 4500 to compare its performance to the 11 inch Minelab Commander Mono. The Commander is definitely a good coil and provides crisp signals on small targets but not as deadly as the Nuggetfinder 8x6 Sadie. Here is a film on the results. We have upgraded the Metal Detector Coils page on the website and there is a new video on there showing the difference in signal intensity between the Minelab 4500 and 5000 using the Nuggetfinder Sadie Mono and Minelab Commander 11 inch coil. Price of Gold Up or Down? Price of Gold Up or Down? The price of gold has been moving sideways and slightly down over the past few weeks, the Aussie price has been held up by a declining Aussie dollar. So where do you reckon its going to go?.. Some Commentators reckon down and some reckon up. All we know is that when World Governments start printing money in uncertain times to spend their way out of recessions and downturns, then inflation goes up and money usually flies to safe havens such as the US and commodities like gold. To us... we reckon gold will go up - How Much? - who knows - but I wouldnt be selling gold yet. Maybe a target of $3000 per ounce over the next few years is not so Fanciful? This is only an opinion, do your own research and make your own decisions on what you believe will happen. This is very powerful software with the data for over 34000 mines included. Nobody gets ALL the gold. Theres still plenty left for you. Just got a rumour of another 4 ounce nugget found! p.s. Get those Section 20a's in and get out there prospecting!